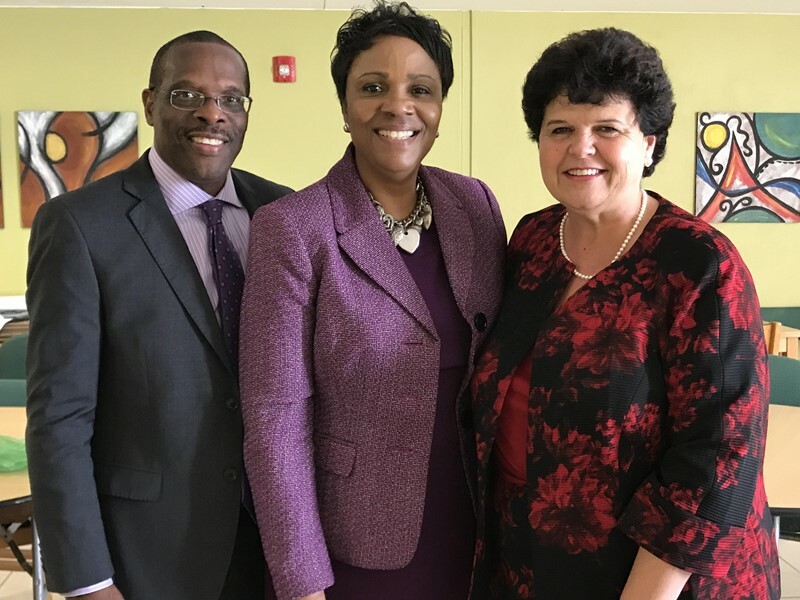 Principal Kalmar Richards — who is expected to be named the Acting Commissioner of Education this week — was recognized by her colleague — school principals from both the Public and Private sectors as CedarBridge Academy celebrates its 20th Anniversary. A group of Principals recently gave Mrs Richards flowers, and Glenn Fubler from Imagine Bermuda said, “Her peers have sought to ‘give her flowers while she still can smell them’, as a token of appreciation for the stellar, foundational work that she has done from the start of Cedarbridge. Like noted pioneers in many circumstances, Kalmar Richards has had to overcome the odds, as often occurs in new approaches in any society. “She has been an exemplar as a ‘servant-leader’ in her roles at the Academy. She was one of the original 3 Deputies and within a couple of years took over the helm, ‘in difficult waters’. Always the professional, Kalmar is also able to connect with others. “Mrs Richards knows each and every student at the school by name and demonstrates this no-small-feat as she very often meets each student as they enter the building at the beginning of the school day. “Kalmar has also been a mentor to a number of fellow teachers and some of her mentees are now serving senior roles in various venues. “Given her generous spirit, Kalmar Richards has also been an advocate and practitioner of collaboration, throughout her career. What?!? No Diallo in that photo opportunity?? What a terrific choice to become ACTING COMMISSIONER FOR EDUCATION. Kalmar Richards is dedicated, has served all students to be very best of her professional ability, is God-fearing, loves the job. Happy that a Bermudian was chosen to oversee Bermudians! !